Students will go wild for this hands-on habitat lesson. Who can help the animals find their homes? 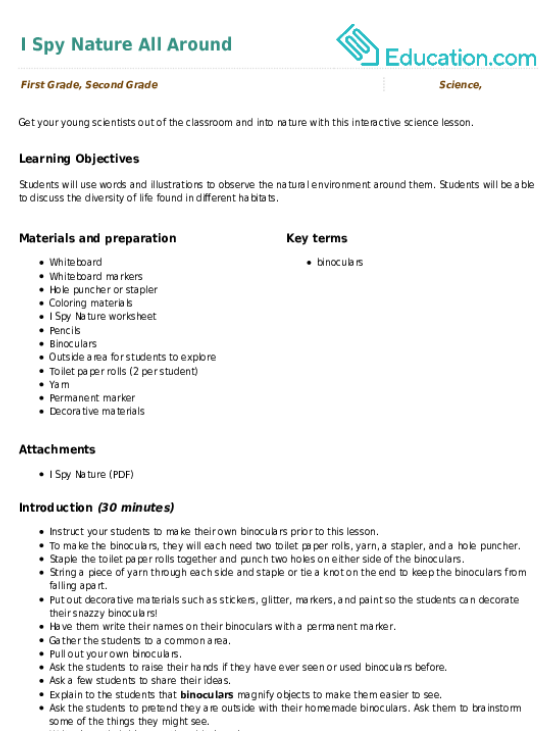 Explore the life cycle of a pumpkin with your kids with this colorful cut and paste growth chart. In this worksheet, students will read two different passages about the platypus. Kids will compare and contrast the passages, and identify the main ideas. This worksheet teaches kids about animal habitats. 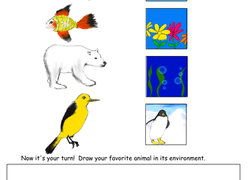 Kids match each animal to its habitat, then draw a picture of their favorite animal in its home. 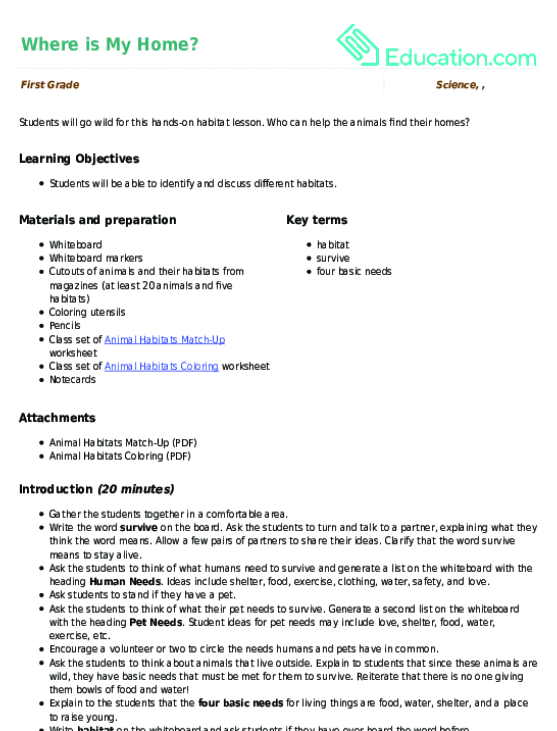 In this fun animal-themed lesson plan, students will get a chance to learn all about animals and their homes! What Do Living Things Need? Food, water, oxygenâdecide what living things need on this reception science worksheet. Discuss with your child what she needs to survive and grow. Use this lesson to teach your students about the various types of forests by drawing them on a box! Get your learning lasso ready for this plants and animals round-up! Can your child tell the difference between a living and non-living thing? What makes a living thing? Give your blossoming learner a fun way to identify living things with this coloring series. Here's a fun dot to dot featuring the morning sun that will give your child counting practise. 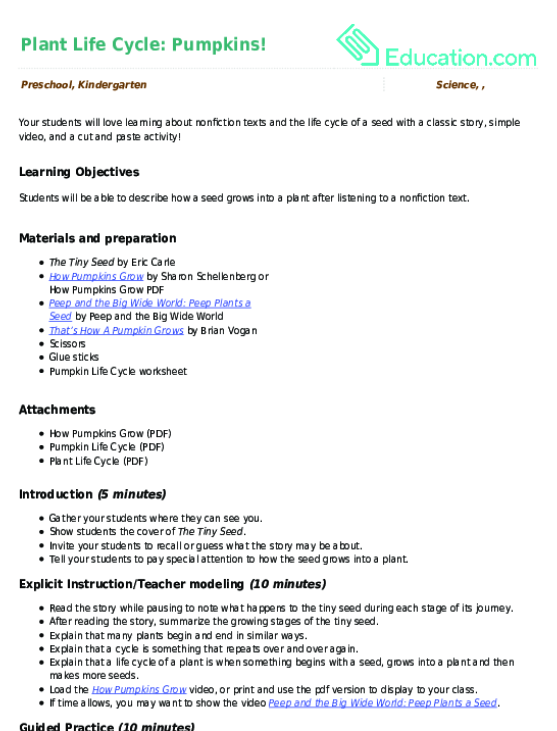 Your students will love learning about the life cycle of a seed with a classic story, simple video, and a cut and paste activity! Plant your own paper flower garden with this fun activity! Your child will colour the flowers first, and then learn to sort them out. Meet the inhabitants of the arctic tundra with these delightful printable, which features a cast of caribou, arctic fox, arctic hare, and ermine finger puppets. Little zookeepers can have some fun placing these animals in the right spot--do they fly, swim or crawl? 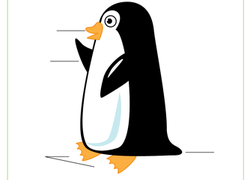 This friendly-looking penguin is cute enough to cuddle, but your kindergartener can start by filling out this chart of penguin parts. Teach your preschooler to choose healthy foods instead of sweets. Help him move his way through the maze by picking out the healthy foods. Go on an adventure hike and discover what's in your backyard or around your neighbourhood! Help your preschooler look for living and non-living things. Every animal wears a unique type of covering. Learn the difference between fur, feathers and scales with this adorable animal worksheet! Animal flashcards are a wonderful way to help young kids build basic skills in word recognition and comprehension. 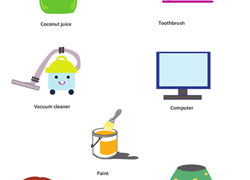 Use this worksheet to help teach your preschooler what everyday things use electricity to function. 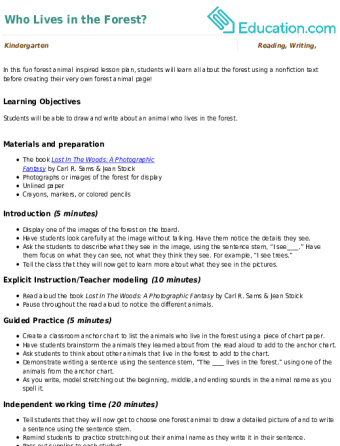 This worksheet will help teach your kindergartner the basics of botany, by asking her to look at the pictures and then decide what a plant needs to grow tall. Get your young scientists out of the classroom and into nature with this interactive science lesson. 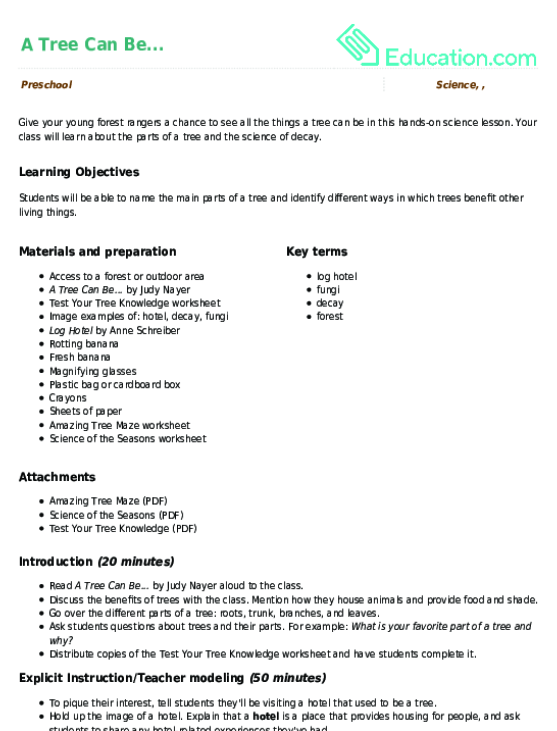 In this fun forest animal inspired lesson plan, students will learn all about the forest using a nonfiction text before creating their very own forest animal page! Give your young forest rangers a chance to see all the things a tree can be in this hands-on science lesson. Your class will learn about the parts of a tree and the science of decay. 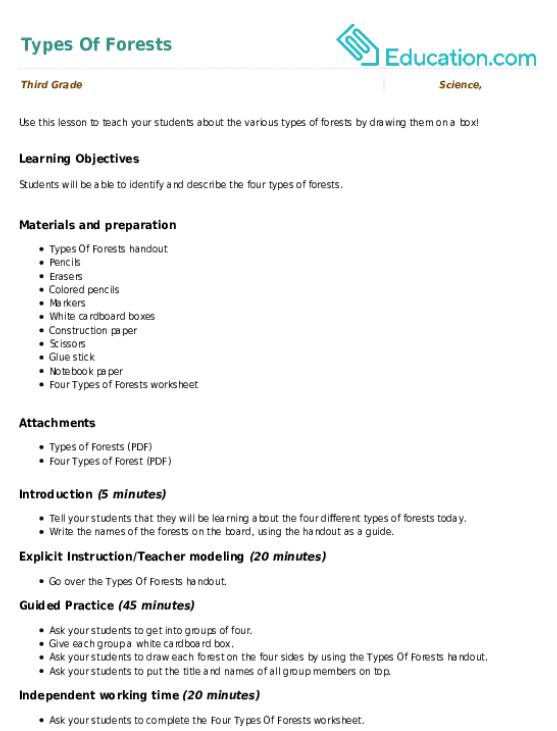 Learn more about the earthworm by reading the diagram and, if you dare, conducting a few of the experiments on the next page.